Coming home to a wine cellar is a dream come true. 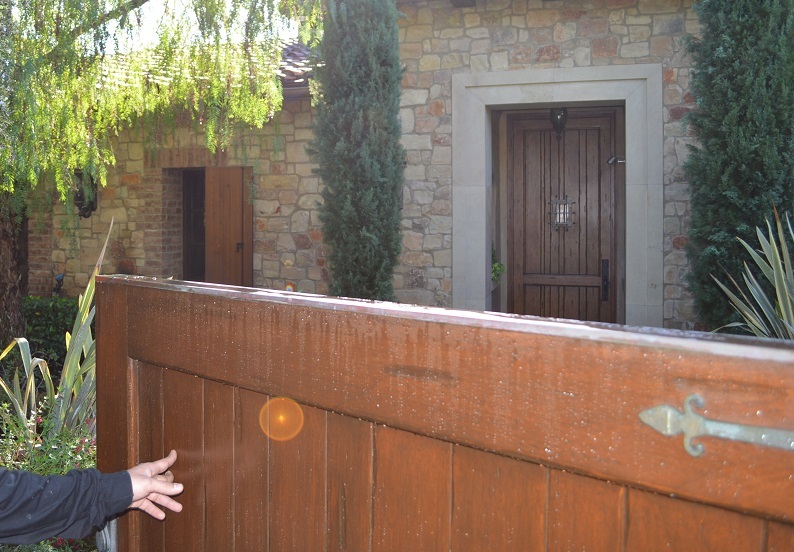 Knowing where the wine cellar cooling unit is located (such as in the backyard), is important for understanding how often you’ll need servicing or repairs in the Los Angeles area. Work with M&M Cellar Systems, to determine the frequency of servicing your unit to avoid big problems. Let’s say you recently moved into that one, perfect, home. It has everything you wanted – a view, a gourmet kitchen, and a wine cellar. One day you notice a funny noise coming from the wine cellar cooling unit that sits out by the patio. You decide to ignore it. Three months later, you are preparing for your big party and find that the temperature in your wine cellar has gone up. “Up”, as in the temperature of a Los Angeles summer day, up. You need an unexpected cooling unit repair, and frantically call repair services. Expensive Wines deserve the best when it comes to the servicing of the cooling unit. Call Mario of M&M Cellar Systems for any wine cellar cooling unit repairs. None are available before your big party begins…. If you ignore outdoor cooling units for too long, you can end up with a problem that can’t be swept away. M&M Cellar Systems understands the possible problems that can come with outdoor units. associated with the different locations chosen for cooling units. have more need for servicing than one which is kept in an indoor environment. questions of the previous owners before they moved in. What questions? Were there any wine cellar cooling unit repairs performed? What was the schedule of the routine maintenance? Did any pets spend time near the outdoor cooling unit? Did you notice that the location of the equipment created any problems? But What Specific Problems Are You Talking About? Nature comes with weather, animals, and dirt. Any of these can negatively impact your cooling unit’s ability to safe-guard your wine. 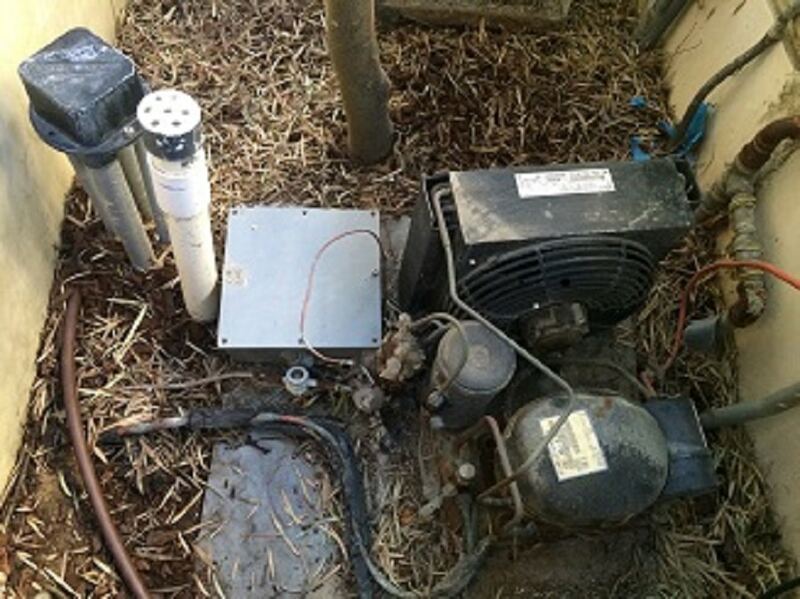 Even if you service your unit regularly, its outdoor location can create unexpected problems. Remember that any time a condenser fan is blocked due to debris, it loses some of its ability to keep your wine cellar safe. This will likely result in repairs. A condenser grate, completely encased in mud and rocks from a rainstorm. 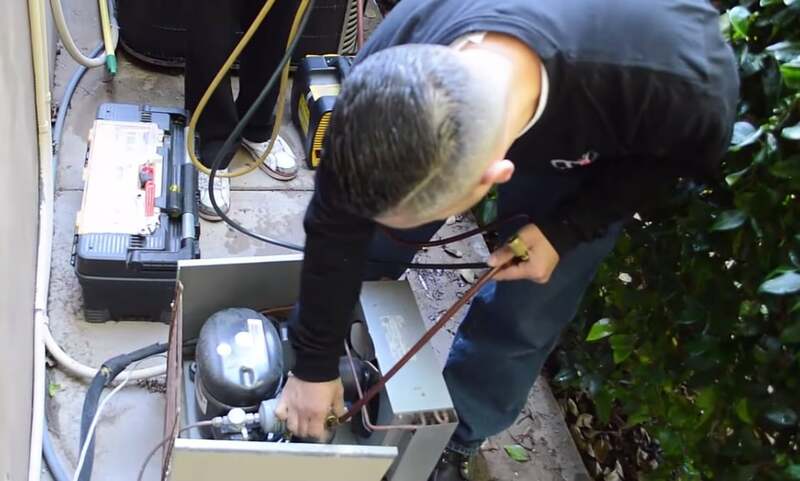 A while back, we made a service call to a Los Angeles home with an outside condenser unit. We found the outer grill completely blocked by caked on mud, leaves and rocks. Recently, there had been an intense storm event which had turned the surrounding soil into mud. As the rain pounded down, the condenser was repeatedly splashed, encasing it in a coating of mud, rocks and debris. By the time we were called, it had been like that for some time and the temperature in the cellar had gone way up. Shortly after this, we made another service call to an Orange County, California home. When we arrived, we found a thick build-up of animal hair blocking the condenser fan. It was discovered that the owner’s pets had taken a liking to the area next to the condenser. Over time, enough hair had been sucked in by the fan, that the wine cellar cooling unit was barely functioning. The owners had paid little attention to the mechanics of their wine cellar. They only took action after they noticed that the cellar felt too warm. As you know, when temperatures in the cellar go up, the quality of the wine goes down. On another call, we found a cooling unit set up inches away from the clothes dryer exhaust vent. 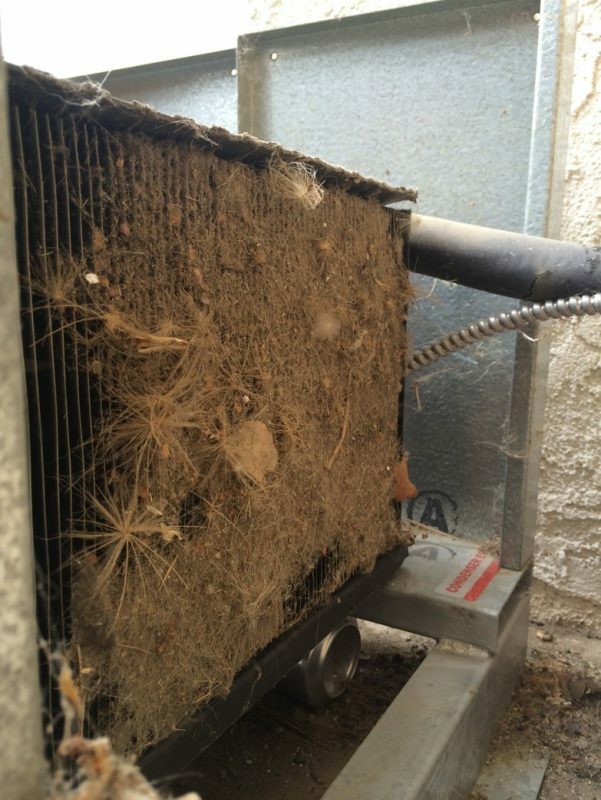 The condenser fan was completely clogged with lint, which had been building up for months. Again, the ability of the condenser to do its job was brought almost to a standstill. The cellar had completely lost its proper humidity level and was overly warm. A wine cellar condenser sitting on a low roof next to a dryer exhaust vent. 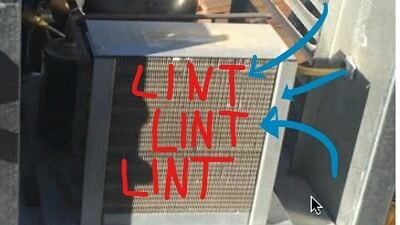 The lint from the dryer vent clogged the condenser, causing an immediate need for cooling unit repairs. As with the home-owners in the beginning of this story, none of these outdoor units had been monitored properly. Given their outdoor location, it should have been a priority for the owners to have regular maintenance scheduled. We even recommend that in outdoor locations, you should call to arrange service visits every six months. There’s no telling what kind of animal, or what amount of dirt, is sidling up to your outdoor unit when you’re not paying attention. On the bright side, there can be an exception to this every six months’ rule. If your cooling unit is set up in a super clean environment, away from dirt, animals and definitely dryer vents, you could possibly consider having it serviced just once a year. You just have to be smart about it. We will be glad to offer our opinion. After hundreds of wine cellar cooling unit repairs in the Greater Los Angeles area, we have discovered a truth. No cooling unit is going to behave just like another. We know that even if you have the exact same system as your neighbor, yours will not behave in the exact same way. Its location and installation give it a personality of its own. Because of this, it should be maintained and serviced as if it is the only one of its kind. We treat every unit we service as if it is the only one of its kind! Having a home with a wine cellar can be a dream come true. It says, “we’ve arrived”! We want to keep it a dream – and not a nightmare! Keeping up with your wine cellar cooling unit repairs – especially if the unit is outdoors – is a small price to pay in exchange for the good life.